NEW YORK, New York – On Broadway’s biggest night, New York City’s Beacon Theatre lit up with celebrities and eager fans while hosting the top theatrical performers and acts of the year at the 65th Annual Tony Awards. Firehouse Productions of Red Hook, New York provided the live sound reinforcement and audio broadcast systems for the event, deploying HARMAN’s Studer Vista Series audio mixing consoles at the front of house position and in the monitor truck, and JBL Professional VERTEC® line arrays for the Theatre’s live PA system. Although the Beacon Theatre houses JBL VERTEC line arrays as part of its own sound reinforcement system, the Tony Awards required Firehouse Productions to replace parts of the “permanent” system with main arrays situated higher in the air to stay out of live camera shots. Firehouse outfitted the Beacon Theatre with a temporary PA system that featured 13 JBL VERTEC VT4888 midsize line array elements per side with a center cluster of four VT4887 compact line array elements. 22 of JBL’s new VERTEC VT4886 subcompact line array elements provided front fill, down fill and under-balcony coverage. Forty-two Crown I-Tech HD 12000 amplifiers powered the system. Firehouse supplied a Studer Vista 5SR console at the front-of-house position, manned by Ron Reaves, which also included a pair of JBL LSR4328P studio monitors. 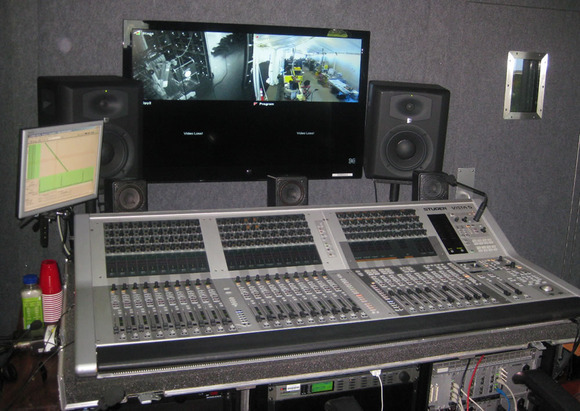 With little space available backstage for monitoring, Firehouse Productions deployed “Engine 1”, a specially-equipped, double-expanding 48-foot semi-trailer production audio unit parked outside the venue. Here, Mike Bove was also responsible for onstage artist and presenter monitor mixes. Firehouse provided a Studer Vista 5 digital console, along with a pair of JBL LSR6328P studio monitors and a Lexicon PCM96 effects processor.